Our beautiful new home is located on the Jetty in Bandon across from the Lighthouse, on a quiet street with only three houses. 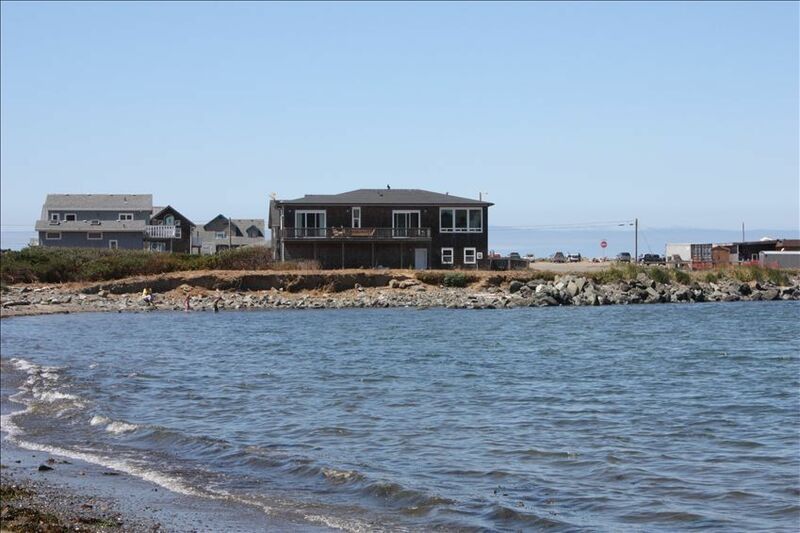 The house looks North to Bandon Dunes and the Beach below with a view to the right looking directly up the estuary into town. It is a breath taking spot with an ever changing scenery. There are always boats passing by, seals playing and even Orca sightings right in front of the house. The small Beach to the right leads into town and the Main Beach to the left is only 200 yards away. Our home is furnished with all of the best equipment including a Bose Stereo Music System with surround sound, Flat Screen TV, Wet Bar, a state of the art kitchen with a Wolf Range and top of the line Oven\Microwave system. The master bedroom has a walk in closet, a four poster bed with a Jacuzzi and personal steam room and Patio doors that face the small beach. Downstairs in the three car garage we have, a Foosball Game, Table Tennis Table, Shuffle Board and Air Hockey Table. As well as a couple of fishing poles and crabbing nets. Our aim is to offer an upscale vacation rental at an affordable price for a large family or a golf foursome. It is a beautiful home with a five star atmosphere . toilet, shower, Jack and Jill bathroom between the other two bedrooms. Our new house rule is that all towels are left clean , before you check out. Fishing Poles, Crabbing Nets, Clamming Supplies. Talk about home away. This is it, beautiful home great views, great location. Clean,secure, and great location. We enjoyed everything about it. We absolutely fell in love with the Edgewaters Restaurant. House and location was great! Overall we loved the house, location and the town. Plenty of room and close to the beach. One recommendation would be to have screens on the patio door off kitchen, bedrooms and bathroom. Had a bird fly into kitchen/dining table area which my son in law was able to catch and put it outdoors. Also experienced a couple of bees and a few bugs. Other than that, thinking of coming back next year! WOW!! Absolutely beautiful home, stunning views, and amazing location!! Where do I begin? From the moment you walk in the door you know this is no ordinary vacation/beach house. The owners did an amazing job making this Home comfortable yet luxurious. Every room in the house absorbs and reflects light. We spent a good 20 minutes just taking it all in. We couldn’t believe how lucky we were. The house was immaculately clean and owners have decorated the house absolutely beautifuly - not cliche. Like I said, not your typical beach house. The house has everything you could possibly need - the kitchen is equipped with everything you need to prepare and present a beautiful meal. The house has plenty of dvd’s, cd’s for the Bose stereo system, and the views! Wow!!! My husband and I enjoyed the sunrise from our bed that overlooked the river or the sunsets on the beach. I especially enjoyed the master suite; the sauna shower is the perfect addition and a great way to warm up after a day at the beach. And I just fell in love with the bedroom furniture!! The house has plenty of towels, wash cloths, and linen. When I say the house has everything I’m not exaggerating. The garage was a special treat for our children. The owners provided a ping pong table, air hockey, 3 bycycles (with helmets), and tons of buckets, shovels, and sand toys. We were traveling quite a ways and did not bring this stuff. It was a nice surprise. They even included fishing poles and crabbing nets. The location is great, too. The beach is a very short walk and teenagers could easily walk to town if they wanted. There is crabbing down on the docks, just a two minute drive and there are also lots of shops and fresh seafood as well. During our stay we drove about 30 minutes south to Gold Beach and took a jet boat up the Rogue River. Great time! On our last day we Chartered a boat from Prowler Charter in Bandon. I snagged a 54 pound halibut while rock cod fishing - straight out in front of the beach. It was a catch of a lifetime!! I can assure you this Home will not disappoint. Just pack your bags, bring a few personal items, and get a few groceries in town. That’s all you need. Jonathan is wonderful to work with and responds very quickly to your messages - before, during, and after your stay. Our experience was so wonderful that we have no desire to stay anywhere else. We can’t wait to come back. Our family spent Thanksgiving week here and had a wonderful time. The house is beautiful and the setting couldn’t be better. We watched seals and birds from the deck, walked the beach and enjoyed old town. We turned out a fine holiday meal using the tools provided in the kitchen. Thanks for allowing us to enjoy your beautiful home! Thank you for the positive review - I love to hear from guests that enjoy the the area, as much as we do - Bandon is very special, for sure and that house and location is a dream come true, for us and our guests. Great place to enjoy the Oregon coast, with a pod of harbor seals as a bonus! We had a delightful week in this lovely home. It is well provisioned. There is plenty to do within walking distance, but also serves as a great location to explore more of the Oregon coast. If you want to bird watch, simply enjoy the tides or fishermen, this is the place. The owner is attentive and accessible. The most delightful surprise, the harbor seals play and live in the estuary rocks near the house. So we had daily entertainment, at one point 63 of them meeting. The house has some great amenities, ping ping, shuffleboard, football, bicycles, crab nets. It is a comfortable and beautiful home, a great find! Thank you for your comments and I am so glad you enjoyed the house. It is an amazing location to wake up to each morning - always something new happening across the water - look forward to working with you again in the future and many thanks for the review. We require a Credit Card to keep on file. No fee will be applied prior to your visit. Customer agrees, by booking ths rental that any damages or exessive wear and tear may be paid for with this Credit card that is on file with the property owner.